Samuel Adams® Boston Ale was first brewed to celebrate the opening of our Boston Brewery. Like Samuel Adams Boston Lager®, it was an old family recipe that was rescued by Jim Koch from his father’s attic. 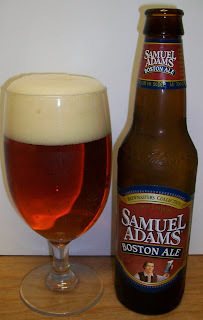 Samuel Adams® Boston Ale, a Stock Ale, has a complex, caramel malt character balanced with distinct spicy and herbal hop notes. Our proprietary ale yeast imparts a variety of fruit and ester notes in both the nose and flavor which are indicative of the style. Stock Ale, one of the few classic beer styles to have originated in the United States, has a strong New England heritage. The style draws its name from the cool "stock cellars" in which it was aged. This technique imparted a smoothness and body which became the hallmark of this style. Keeping with the Stock Ale style, Samuel Adams® Boston Ale is fermented at cooler almost lager like temperatures and conditioned much longer than most ales. It also is Krausened and dry hopped. I had this beer for the first time last week at a party and I thought it was pretty good. Everyone at the party was drinking their beers out of the bottle. It was hard to control the beer snob in me. I wanted to pour it into a glass take a good sniff, hold it up and check out the color etc. I did restrain myself and drank my beer like a normal person. It’s hard to be normal when it comes to beer, darn hard. The beer pours a nice copper color with amber hues and a fairly rich off white head. This brew is also highly carbonated with lots of tiny bubbles rising up from the bottom of the glass. Nice aromas on the nose; sweet caramel malts, almost a toasty aroma with the malts. There is also a light hop presence on the nose. The taste starts out with sweet light malts up front then a very nice effervescence over the tongue. The back-end is a building hop bitterness by the end of the swallow but it seems to dry nicely. There really isn’t a lingering aftertaste. The aftertaste is very light with malts and hops bitterness and diminishes quickly. This is a very clean and refreshing beer. I think I like it, Hey Mikie! Sorry a little 70’s flashback. This is a nice drinkable beer. It is very refreshing with a nice malty backbone to it and just the right amount of a hop bitterness to give a dry finish without leaving a lingering bitter aftertaste. The head has diminished to just a nice protective film over the top of the beer with a decent ring around the glass. It is also leaving some very nice lacing. This could be one of the best regular offerings that Sam Adams has. There is no wow factor but even more importantly there is nothing offensive with this beer. It is a pretty decent APA, American Pale Ale. Well, this is a good ale, I’m don’t know why it’s an APA and not an American Amber Ale. I guess that’s why I’m writing a free blog and not getting the big beer bucks. At any rate this is good for an APA or an Amber Ale. I’m going to give this a B-. Like I said this may be the best of their standard offerings. I do recommend this to anyone that is looking for more full bodied beer, well fuller than the typical American Macro lagers anyway. It is a good fresh clean beer. Plus it’s not a price if you can pick it up ~ $6.50 for a 6 pack.